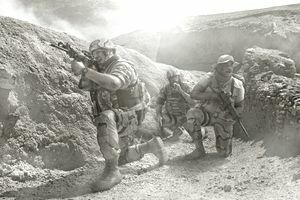 The 03 Occupational Career Field in the U.S. Marine Corps are combat arms related in the Infantry. The USMC Infantry are ground forces that are trained to locate, close with and destroy the enemy by fire and maneuver, or repel the enemy's assault by fire and close combat. Riflemen (0311) serve as mounted or dismounted troops and act primarily as scouts, assault troops, and close combat forces within each infantry unit. The Infantry are amphibious warriors who provide versatility in chaotic and uncertain conditions of crisis and conflict. They employ a variety of weapons and systems. Through communications links, supporting arms, (artillery, naval gunfire, and close air support; sea-based) the USMC Infantry are capable of combat onto vital littorals in any climate or place, day or night, against opposing forces. The Infantry is capable of projecting a full spectrum of combat, including NBC; using maneuver warfare to locate, close with, and destroy the enemy by fire and maneuvering either on foot or mounted on trucks, assault vehicles, assault craft, or vertical assault aircraft. The USMC infantry MOS's can secure and defend self and vital terrain by repelling the enemy's assault by fire, maneuver, and close combat. They are cultivated in a leadership continuum that develops the basic warrior through experience and coaching into a fully qualified non-commissioned officer and staff non-commissioned officer. A combat leader of Marines trains and directs the actions of Marines in teams, sections, squads, and platoons, while coordinating with higher and adjacent units and supporting units. Not just everyone in the Marine Corps can do these combat professions. All require a higher level of physical fitness, mental toughness, and tactical skills that will be tested during boot camp, advanced training, and selection and assessment programs. These types of professions require your level of fitness to be above average prior to you attending the Marine Corps Recruit Depot — or Boot Camp/Basic Recruit Training. Often hailed as the toughest boot camp/basic training in the U.S. Military, your arrival in top condition will help you avoid injury, learn your basic Marine Corps function, and help you reach your occupational specialty goals (if Infantry/RECON/other). The advanced opportunities in military combat specialties are many within the Marine Corps. Your performance and desire at Basic Recruit Training will determine your future occupation. Infantry Occupational Career Fields are competitive but vast enough to fit most people's combat specialty wishes.